We have been having some wonderful summer thunder storms over the weekend. I thought I would share a bit of last night's lightning show with you. Both of theses shots I caught with my iPhone (which has proved to be quite the wonderfully handy pocket camera) near our apartment complex. 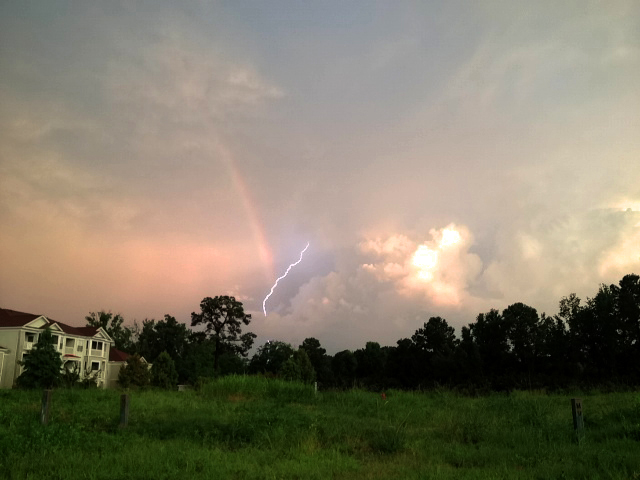 The first bolt of lightning I was able to catch with the remains of a huge rainbow. 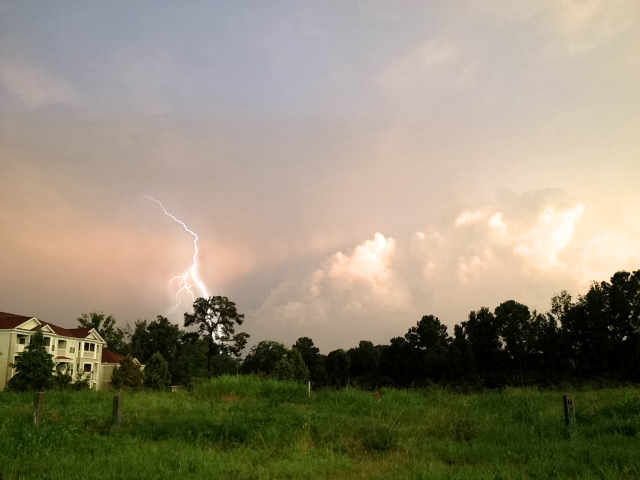 And the second image, a lightning bolt again in the same location. Immediately after stopping to take these we rushed home, I grabbed the camera, and then back out again & down to the beach. There is a nice pull off area right as you get onto Sullivan's island. There are signs everywhere warning of rough water and unseen currents so we don't normally stop here. But it was the perfect spot to watch an incredible display of lightning over the ocean. I did try to capture some of the lightning there but without a tripod and it being pitch black in between it was nearly impossible. Apparently we weren't the only ones with that same idea. About 30 or so cars were parked in the small parking area really meant for 20. We sat on the back of our little Saturn for about an hour watching the lightning flash all around us, sipping our coffee and looking out to sea. It was quite beautiful and a spectacular way to end our evening. And last but not least, a sneak peek into what I've been working on this weekend in my free time. I won't say much and leave my full description to when I am finished but I will say that I am quite excited and cannot wait for you to see it. This is just a tiny section of the entire piece. Enjoy (wondering)!